The spiritual nourishment was too rich for this boy's system. Source: Florence Morning News - Jan 9, 1926. 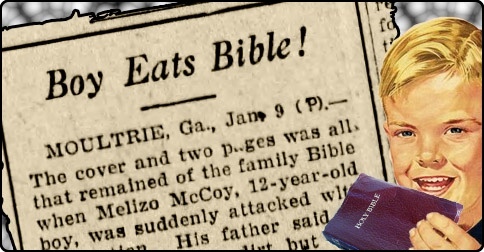 MOULTRIE, Ga., Jan. 8 —(AP)— Devouring the Bible in the literal meaning of the expression, so upset the digestive apparatus of Mellzo McCoy, 12-year-old Colquette county boy, that he developed symptoms similar to acute appendicitis. This was learned today when a local physician, who was consulted by the father of Mellzo, reported that his patient was recovering rapidly from the effects of his scriptural diet. Mellzo gratified his appetite secretly, the physician stated, and his appetite for the scriptures was not learned until the illness developed. The physician said the youth readily admitted having eaten the pages of the Bible. Only the two covers and one or two pages on which the family record was kept, remained of the family Bible when Mellzo became ill.
Mack McCoy, father of the boy, said he did not know of his son's appetite for paper, although he knew the boy had been eating dirt. Take, eat, this is my scripture? The disorder has a name: Pica. Remember the strange kid who would always take a lick of the paste in grade school? Probably not quite pica, but it makes you wonder. As for the kid who ate the Bible - That too shall pass. The mucilage glue we used in grade school over a half century ago was the same plant resin that was used to make marshmallows. KDP: "that too shall pass"
Pica crossed with religious mania apparently. We had a story on here about a girl who had to have a ball of her own hair removed from her stomach due to Pica.